On June 16, 2018, astronomers across the world witnessed a mysterious bright explosion which lingered in the sky for a few weeks. The cosmic explosion named AT2018cow traveled nearly 200 million light years before it disappeared from the sky. The explosion was discovered by the Asteroid Terrestrial-impact Last Alert System, also known as the ATLAS, a pair of survey telescopes in Hawaii. The Cow captured the attention of astronomers because it was unlike a standard exploding star, also known as a supernova. When a large star (such as our Sun) runs out of fuel, it can no longer hold its weight. The pressure from the layers of the star becomes so great that it collapses onto itself, creating a spectacular explosion. The dying star generates light that is a million times brighter than the galaxy itself! Most exploding stars take several weeks to reach their peak luminosity while the Cow reached its peak luminosity in just two days. It also became ten times brighter than a regular supernova. Initially, it was assumed that the explosion took place in our galaxy because of the Cow's luminance. But spectroscopic analyses concluded that the explosion occurred in CGCG 137-068 which is a galaxy in the constellation Hercules two hundred million light years from the Earth! Additionally, the explosion did not give high readings of radioactivity like most supernovae do. Instead, the Cow showed the traces of helium and hydrogen. The Cow did not cool down after it exploded which is also unlike general supernovae. According to Amy Lien, one theory explaining the Cow is that a star came close to a black hole causing the massive blast. She claims that the star would have to be a white dwarf (a star that had already exploded and burned through all its fuel) because of its lack of heavier elements. Another team of astronomers, Raffaella Margutti and her colleagues, believe that the Cow might have been the birth of a black hole (an extremely dense region in space from which light cannot escape; read more here) or a neutron star (when an exploded star collapses into itself, read more here). X-rays of the Cow have shown that it reflects cooler, denser material similar to black holes. Also, observations showed that the Cow was getting brighter after the explosion occurred. This emission could have been caused because of a shockwave from the engine of a black hole or neutron star. Witnessing the birth of a black hole has never been recorded in history and the Cow may be just that if Margutti and her team are correct. 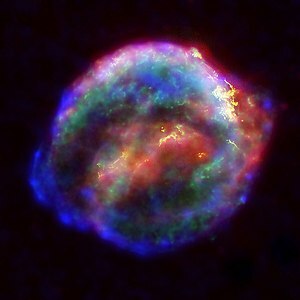 It is still unclear why the blast occurred, but most evidence suggests that it was not a typical supernova. Astronomers are still trying to gather more evidence to find the reason behind the Cow.